The Houston Texans visit the Baltimore Ravens in Week 12 of the 2017 NFL season. PFF previews the top player matchups of the game. 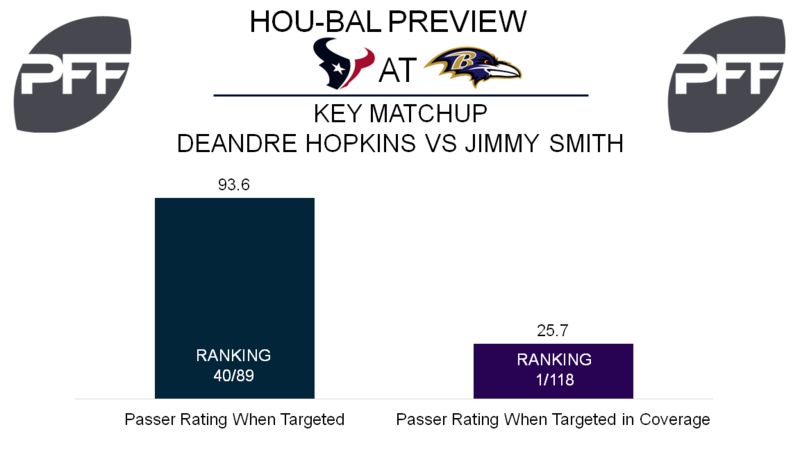 WR DeAndre Hopkins vs. CB Jimmy Smith – Since Tom Savage was forced back into the starting role, Hopkins has seen 37 targets; the most in the league over the past three weeks. Despite the volume, Hopkins’ passer rating when targeted of 77.9 in that span ranks 51st among qualifying receivers while his 2.28 yards per route run rank 17th. Hopkins primarily runs his routes from the left side, meaning he will see plenty of Smith who is on pace for a career year. Smith’s overall grade of 90.3 ranks sixth among corners, while his passer rating when targeted in coverage of 25.7 is best in the league. Savage and the Texans have shown they have faith in Hopkins against anyone, so this matchup will be a nice measuring stick for both players. RB Lamar Miller vs. DI Brandon Williams – With D’Onta Foreman out for the season, Miller figures to have an expanded role the rest of the way. With an overall grade of 78.6, Miller ranks 19th among all backs and is 42nd at the position with 15.1 percent of his yards coming from runs of 15 plus yards. To this point, Williams has been a force in the middle for the Ravens as his run-defense grade of 87.4 against the run ranks 11th among interior defenders. Among eligible interior defenders, Williams’ run-stop percentage of 13.8 is fourth best in the league. If Miller and the Texans are going to establish anything on the ground it’s clear they’re better off avoiding Williams. 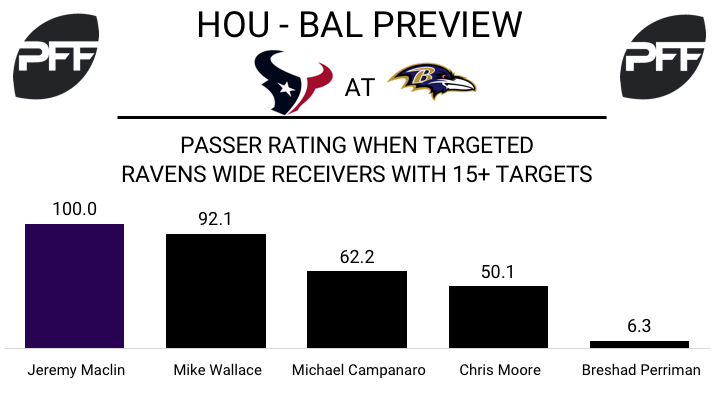 WR Bruce Ellington vs. CB Lardarius Webb – With Will Fuller out of action last week, Ellington stepped in as the Texans’ second option and produced. Last Sunday, Ellington ran 33 routes and hauled in six of the seven targets thrown his way. Five of those targets came from the slot, where he figures to play the majority of his snaps across from Webb. In the slot, Webb has been one of the more generous qualifying corners as his 2.12 yards allowed per coverage snap ranks 47th, while his 6.8 coverage snaps per reception is 42nd. Three of Ellington’s targets last Sunday came on hitch routes, but it will be interesting to see if the Texans try using Ellington’s speed for a few go routes where opponents have had a 116.7 passer rating when targeting Webb. WR Jeremy Maclin vs. CB Kareem Jackson – Maclin has a favorable matchup against Jackson this week, as Jackson has allowed the second highest passer rating when targeted in the slot (125.3). He should see a lot of balls thrown his way; on average he’s targeted once every 4.9 coverage snaps. Maclin was quiet last week after posting 151 combined yards in his previous two games. On the season quarterbacks have a 100.0 passer rating when targeting him, which leads all Ravens wide receivers. G/T James Hurst vs. Edge Jadeveon Clowney – Hurst started at left tackle in Week 11 after playing left guard in each game to start the season. Regardless of where he plays Monday, he’ll see a lot of Clowney playing on the left side of the offensive line. Clowney has been strong both pass-rushing and in run defense this season, posting grades over 80.0 in each. Hurst has a grade of just 42.5 on the year, so this could easily be a weak point of the offensive line if Ronnie Stanley is unable to play again due to injury. How the left side of the line is able to contain Clowney will play a big role in the effectiveness of the offense. RB Danny Woodhead vs. LB Benardrick McKinney – Woodhead played 13 snaps last week in his return from injury. On those 13 snaps, he ran 12 pass routes and was targeted on six of them. Even more absurd, he has been targeted nine times on just 17 pass routes this year. McKinney could be a tough matchup for the receiving back, as he averages 15.1 coverage snaps per reception allowed (third among linebackers). McKinney, for the second time this season, saw zero targets into coverage last week against the Arizona Cardinals.